R&B singer Andre Williams, who collaborated with Stevie Wonder and The Temptations among many others, died Sunday, March 17, in Chicago, his label Pravda Records reports. He was 82. Williams died as a result of colon cancer after being diagnosed two weeks ago and following a string of other health issues, his manager Kenn Goodman confirmed to Billboard. “But was committed to trying to sing and record again,” Goodman says. Zephire “Andre” Williams was born Nov. 1, 1936 in Bessemer, Ala. His career began in the early 1950s when he moved to Detroit and situated himself in the city’s hotbed R&B scene, eventually leading him to collaborate with a fledgling Motown Records. His first stint was with Fortune Records, where he sang lead vocals for The Five Dollars (later Andre Williams and the Don Juans) and recorded his biggest hit that also landed him the title “Godfather of Rap,” “Bacon Fat.” You can hear Williams,. a.k.a. “Mr. Rhythm,” sing that tune during his 2012 Daytrotter session below. We are extremely saddened to report that our beloved artist Andre Williams passed away Sunday March 17, 2019. He was 82 years old. Andre was a major force in Chicago, Detroit, and the entire world of soul, rock , garage, and every other genre he ventured in. He worked with everybody, saw it all and had a presence that was hard to describe. He will be missed, but thankfully, his music lives on. His last recording on Pravda is appropriately titled “Don’t Ever Give Up”. 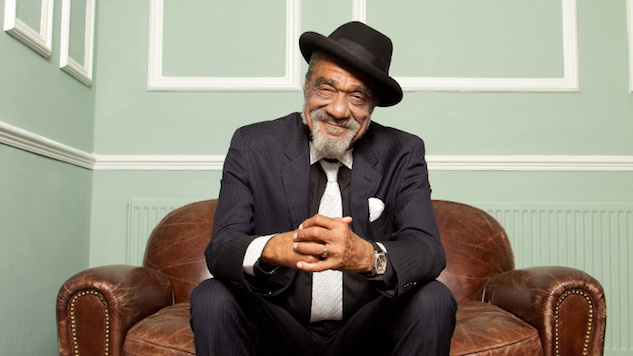 Again, listen to Andre Williams’ 2012 Daytrotter session below. Further down, listen to recordings from a 1998 show at Tramps in New York City.